So NICS checks in January proceeded at a brisk pace -1,772,794 - the second highest on record for January. (highest was 2,495,440 in Jan 2013) and Washington State accounted for 38,018 of those if you want to suspect the inane new laws there as contributing. So Yeah. Go TEAM NICS. Sort of shows how unnecessary such a list of gun owners is. This list is not in the best interest of the citizens of the US, and frankly shouldn't be allowed. Fails the constitutional test too (not that government types give a s**t about that anymore). If anything the only list that should exist is those who cannot own, due to some types of convictions, mental illnesses etc. And many convictions should not preclude gun ownership either, so even that list is too big. Wouldn't need a waiting period either, your not on the list, here is your purchase. In theory all approved requests are deleted within 24 hours, and in theory they are only checking those requests against a list like you describe. But I think, given the NSA spying and other programs, and what happened in Canada, it is naive to think the government isn't retaining the information for every single request made. You bet your life they're keeping it all safe from the public that would only use the info to harm themselves. Why is Pan's tagline rattling around my head...and why am I smiling? I hope that makes them nervous too! 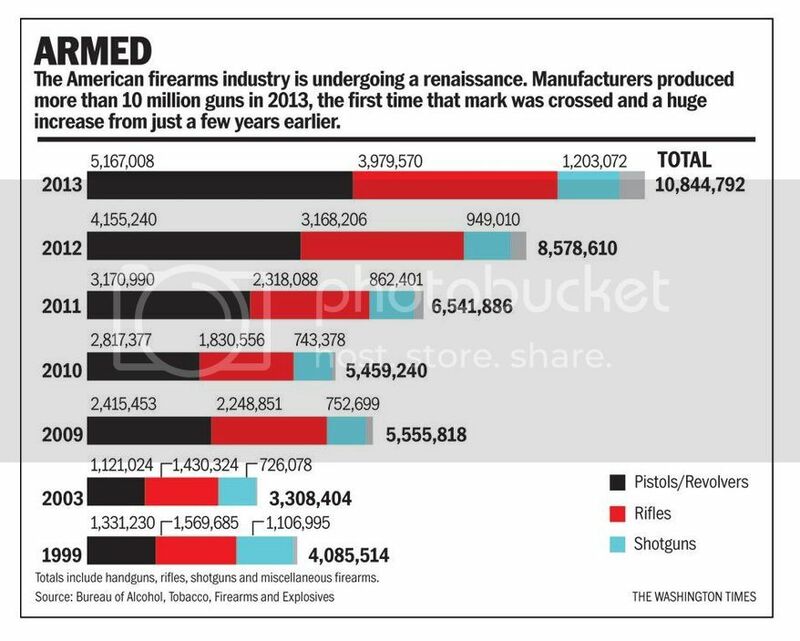 Another interesting trend in that graph is that not only have the absolute numbers gone up dramatically, but look at the proportion of handguns to rifles and shotguns. That's the CCW trend right there. Go back 10-15 years and more rifles are made than handguns. But after the early '00s, handguns took over as the leading type of firearm. I love it. All of these firearms in the hands of private citizens nationwide. There's no putting that genie back in the bottle for the grabbers. Every draconian proposal just increases the sales further, and even if they did get their way with new gun control, look at how many are already out there. They've lost this battle in the Culture War, and it's one of the few areas that give me a little flame of optimism. Yup. I love it too. It is probably the one graphic that will (and should!) scare the statists silly. So we are down by 1/2 million or so for the same period last year- but still on track to break 20 Million checks for the third year in a row. But nothing is going on and you are isolated crazy if you think there are any problems worth worrying about. Oh and also, AP polls say firearm ownership is declining. Well, the number of people willing to openly admit they have firearms without fear of being put on some list is declining..
For sure. I just love how they churn out these polls in an effort to influence public opinion. They're so detached from reality. So let's see, record levels of NICS checks for several years in a row, but oh, gun ownership is declining! Even as other polls show public support for gun ownership at highest levels ever. Even as other stats show women the most enthusiastic new demographic among gun owners. But yeah, gun ownership is declining says the AP. Uh-huh. Frankly any "poll" by a lamestream media group is suspect. Just check the wording of the poll and you can make any claim you want. The AP like any MFMer are suspect from the start. PS-Love the new avatar G! Looks to be on pace for about the same level as last year, which was just a slight dip from the high of 2013. And since May the year over year totals have been up by 200,000 or so every month.. ( gee I wonder if the Ferals had anything to do with it?) and I suspect with the recent stock market crash, and growing unrest in the Middle East, and the continually worsening border situation and obvious persecution of Christians in the United States, I am betting you are going to see a new record, something closer to 21.5 Million. I guess its good more people are waking up - I just hope its not any libtards. The Federal Bureau of Investigation processed a record number of background checks in the month of September, indicating that gun sales were at an all time high for the month. 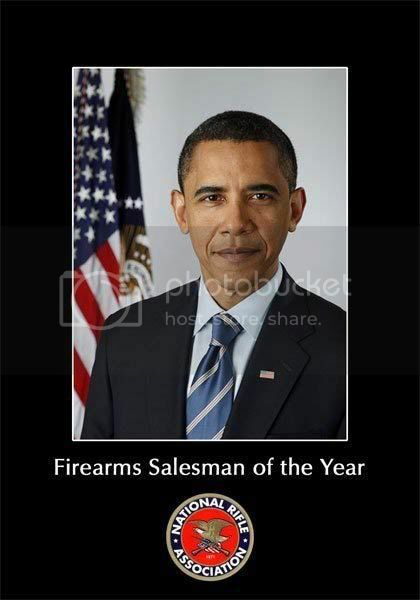 The FBI’s National Instant Background Check System processed 1,795,102 applications to buy a firearm in September. That represents a new record: 335,739 more checks than the previous September high set in 2012, or a 23 percent increase. The number of checks done in a particular month is considered a reliable gauge of how many gun sales have occurred since background checks are required on all sales made through licensed firearms dealers. The actual number of sales is likely higher since multiple firearms can be sold to the same person by a dealer under a single background check. The numbers also do not account for sales between private parties that do not require a background check. September is the fifth month in a row to set a record for background checks. May, June, July, and August all produced record numbers. The summer of 2015 has seen the most gun sales on record. The summer has also seen an increase in calls from some Democratic presidential candidates, including frontrunner Hillary Clinton, for new gun control laws. Clinton has said she would use executive orders to implement certain forms of gun control. Well, the Left is never too interested in the actual consequences of their actions-- they got what they wanted as soon as they said they wanted to ban guns... thus sending the moral signal that they are better and superior. They got their ego stroke, so they don't really care if that ego stroke resulted in more of the problem than existed before. Its probably actually a bonus, because the longer they have a problem to feel superior about the more ego strokes they can get off of it. Meanwhile I am betting on 21.5 -22 Million checks for the year, setting a new record. Perhaps TPTB really aren't considering a house to house confiscation anytime soon - and really have no plans at all to actually initiate a police state- just enrich themselves as much as possible before the collapse and then disappear. . Or it could simply be that they plan on using chemical /biological WMDs to wipe us out so they really don't care if we are well armed or not. (They have the cure, come to the concentration camp to be processed or die where you are. We don't care..) Or maybe they know the Grey Aliens are coming to exterminate us in their war against the Reptilians (or vice versa) and want us as well armed as possible without causing a panic. ( Maybe I should visit beforeitsnews less often...?) They certainly don't seem to care or are powerless to stop the massive armament and stockpiling of munitions that continues to this day. Why else would he mention doing bans similar to the UK and Australia when they are obviously unconstitutional ( and even if they weren't would be considered so by a troublesome percentage of the population) - Maybe Obama and other prominent Dems are just getting rich off of Gun and Ammo stocks? Do they run Gun shop side businesses? I can't imagine they are oblivious to the bumps they give the numbers each time. They don't care for one reason or another, and I don't think its because they are so stupid as to think that if they did get their laws they would get obedience. Its probably moe of Obama's punk attitude and policy of gaslighting than anything else I suspect. I think this last round of hysterical anti-gun rhetoric is going to make October strong and we haven't even got to the SCoaMF's exploitation in Oregon yet (he is expected to invade those poor people's space tomorrow) so October should be strong, November probably be pretty good and December is always a popular time and with Congress in recess that would be the perfect time for the Tyrant to issue decrees and make sure holiday sales come in strong. A record year is virtually guaranteed. Heck, I might even have to get in some more action! What the heck...can never have enough!